It is hard to express the stunning color of things in New Zealand. The grass is greener and the sky is bluer. Plus all the colors in between are stunning. This is one of my favorite places ever, and a place you really should visit during your lifetime. Along the Waikato river. 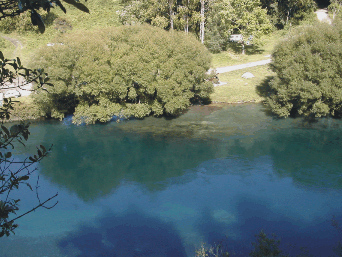 Much of New Zealand's energy is derived from geo-thermal sources. Massive amounts of steam are harnessed by steam generators to provide electricity for millions of residents. The Silver Fern is indigenous to New Zealand.